A bright and frosty morning with snow covered mountains made for a delightful journey across to Tyndrum where we all met up for the onward passage to Cuan Ferry. Here we launched the club Rhib, checked her out and moved her to the steps where she was loaded with the dive gear. ‘The Bruce’ arrived and set about launching as we departed for Eilean Creachan, one of the islands at the mouth of Loch Melfort where interesting contours on the charts suggested some spectacular underwater topography. The dive plan was to put the first wave in to explore the wall on the northern end of the island and swim slowly southwards on the West wall. 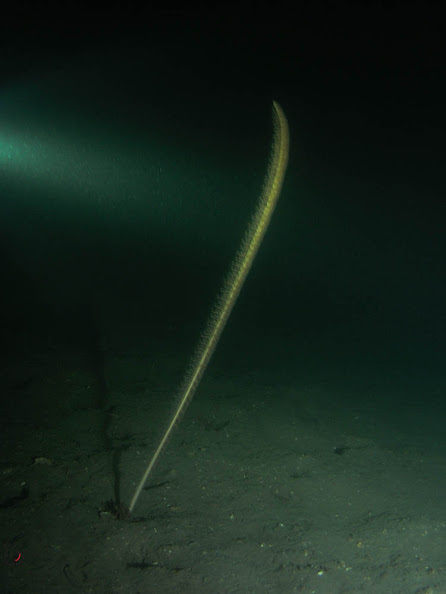 Both groups surfaced reporting a very good dive with highlights being conger eels and two octopi as well a shoals of small fish. With virtually no tide or wind the boat didn’t move and although slightly cold it was very pleasant as we watched the divers bubbles. ‘The Bruce’ came alongside for a quick hallo and blether before heading off to dive around Shuna. Back with ‘Deep Dancer’ and having recovered the first set of divers the second wave went in and explored the foot of the wall initially swimming northwards, collecting a few large scallops from the mud between tall slender sea pens and finally ascending to following the top of wall back towards the boat. An old ‘Fenzy’ crack bottle was discovered and brought up for the amusement of the crew, some of who actually recognised it for what it was, before someone even admitted to having used one ! Lunch was scheduled to be taken at Shuna Cottage and Gary expertly drove us down to the southern tip of Shuna where we moored the boat, changed over cylinders and had our pieces. You can’t spend too long lunching with the short days so we were very quickly back in the boat and heading up the west side of Shuna for the next dive which turned out the be a cracker. In went the pathfinders, closely followed by the backup team, each following a roughly parallel course swimming South. Ten minutes into the dive for some reason up pops a partially inflated DSMB and the two teams were seen to converge. What’s going on here then wondered the boat crew ? The conclusion that somebody had sent up a bag of scallops which had subsequently sunk seemed to describe the scenario so we marked the spot with a depth reading and a transit to the shore and quietly sniggered at the easy picking that would follow ! (Why not the position fixing facility on the GPS/radio ? – ED) The teams then separated and continued their fin south. On surfacing they both reported good life, a few scallops and a wreck. Unbelievable, a wreck down here. But it was and proved to be a small pleasure craft lying upright in good condition with it’s rather rounded bows pointing into the shore and CQR anchor deployed. 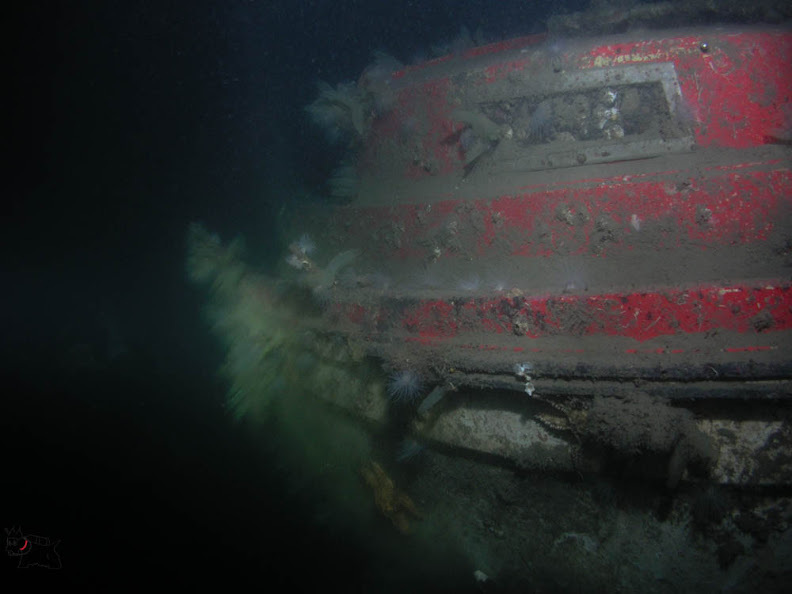 Probably about 9m long with a large cockpit, and cabins fore and aft. What a fantastic find and a great way to end the day. On surfacing we quickly had the engine started and got back to the launch site with just enough time to recover the boat before it got dark having enjoyed a fantastic days diving. Well done to Steve for organising a great trip and many thanks to Gary for towing the boat. Paul has kindly placed some of his superb photographs here and they are well worth a browse. After seeing the two low weather systems headed up each side of the Country we weren’t quite sure what to expect, however the shipping forecast was favourable for Sunday with light winds of 5-10 miles an hour. After Chris had offered to drive, Steve and I jumped into his car at just after 6am on the cold and damp Sunday morning and did the two hours trip across to Puffin Dive Centre were Alan and David were to meet us with their Rhibs at 9am. The weather cleared and we could see snow on the tops of the mountains as we headed along Loch Earn and then the A82 to Tyndrum. Arriving at Puffin for just before 9am we prepped the boats. The wind was slight, but enough to give you a chill. High grey cloud hid small brushstrokes of distant blue. 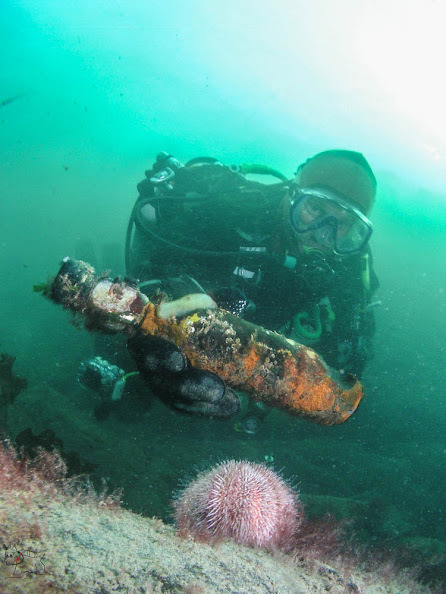 So nine hardy divers and two even hardier Coxswains headed South, the six nautical miles to Insh Island to dive the wall on the North East Corner of the Island, I had dived this once before and typically it has lots of life on it. We had a Ebb Tide and dropped in on 10 metres and drifted around the corner before heading down to find the wall. On Grace Cameron, Chris and David went in first and Steve and I followed after a a last minute kit re-configuration due to a burst high pressure hose (Always worth carrying spare kit!). Steve and I headed down the slope finding the wall at 16 metres and noticed a strong down current pulling us down southwards, so we kept close to the wall and started taking a few photos while dropping to just over 30 metres and finding an overhang which gave us some protection from the currents. With overcast skies I was glad to have my bright torch today, as it was dark but the water clarity was good. 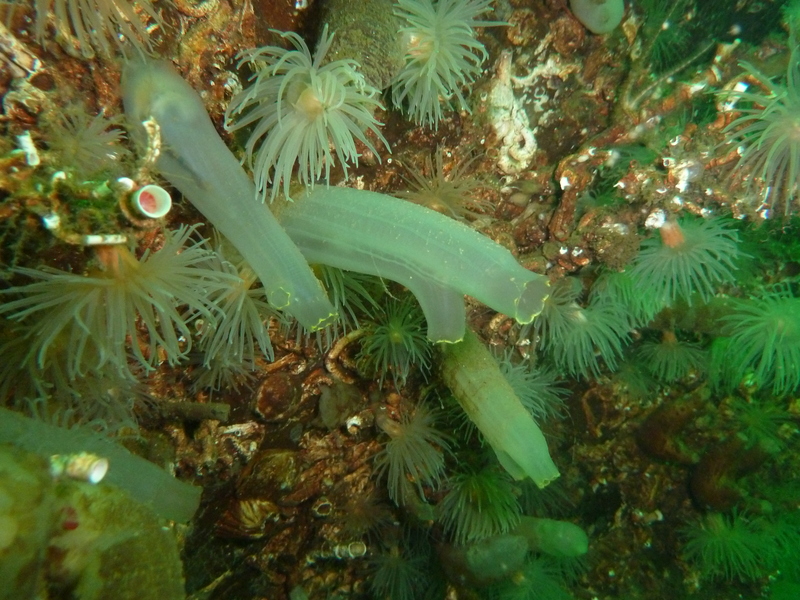 The wall had a mixture of sponges, Feather Stars, tube Worms, squat Lobsters, juvenile cod, several species of brightly coloured wrasse and as we headed towards the shallows the kelp forest which started at 16 metres. Here you could clearly see the current running over the Kelp, so after putting up the DSMB we drifted south with the current to be picked up by Tam and Chris and Dave who by now were already back on board. After picking up all the divers we headed across to Easdale Island, the famous venue for the World Stone Skimming competition, where we chilled out having lunch in the shelter of the harbour, chatting to the Locals as well as the local dogs that wanted to see if they could benefit from a free sandwich or tasty snack. 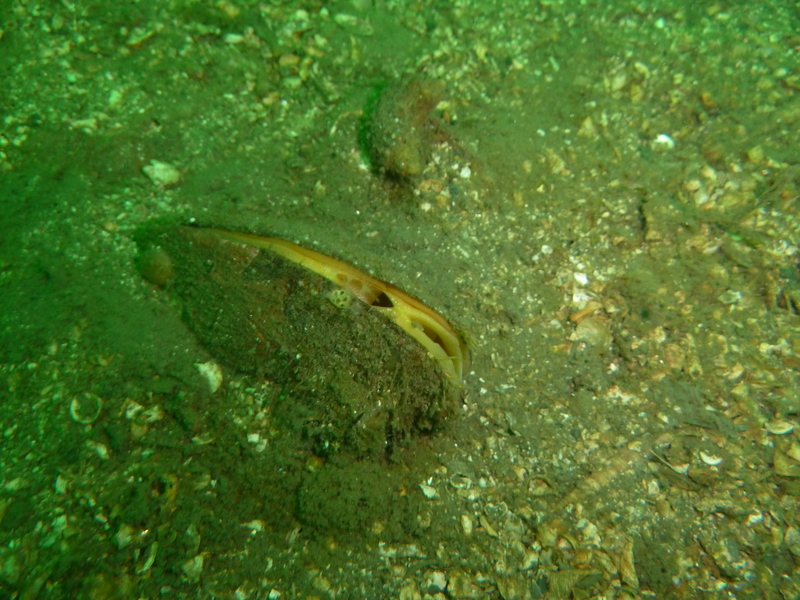 The afternoon dive was a scallop dive and it was good to see the habitats undisturbed by trawling. Hand picking scallops allows us to be selective and not affect non targeted species of animals such as sea pens. With the Benefit of Cox’s we were able to save two hours and were back in Perth for 6pm on the Sunday Evening. Thanks to Steve for organising the trip and Alan and David for the use of their Boats. Saturday, in Perth, was probably the best day of Summer so far. Blue skies, perfect temperatures and the occasional fly, lazily passing, irritating in it’s intensity. A pleasant day as the evocative aroma of a hundred barbecues, dragged from their garages, overwhelmed the peace of early evening. In short a good day. Sunday was not. Whitecaps sweeping up the Sound of Kerrera and grey water looked uninviting as rain clouds dashed across the knockan landscape of Kerrera. Regardless it was a good turn out to what had been themed as a diver drills day, a project of Steve’s who had organised three boats and and many divers to fill them. 09:30 in the water was the plan and spot on time the new ‘Plan B’ and ‘The Butcher’ were launched. Plan B offering recreational dives while The Butcher acted as a diving platform for a dry-suit familiarization and rescue drills. The remaining folk were in ‘Deep Dancer’ and although last in the water, had taken the opportunity to do a briefing and perform a dry run of the DO4 drill in preparation to the open water session. Having launched, they motored down to Horse Shoe bay on the East side of Kerrera to look for a suitable site. Finding the bay a little shallow, though adequately sheltered the boat moved down to a site on the inside of the Sgeirean Dubh reef that is home to the South Kerrera beacon. A few seals bobbed around but were not encountered underwater. First wave in did a good lesson manoeuvrings a shot weight around and after nearly an hour under water lifted it successfully to the surface. The second wave repeated the lesson and again the shot was moved and lifted appropriately before divers and shot were recovered into the boat and a return to Puffin made. Has to be said that the return trip was much more pleasant than the trip out although one particularly large hole was found ! Back at Puffin, ‘the Butcher’ and ‘Plan B’ were getting ready to depart for the second dive of the day having reported a successful set of drills and some low vis pleasure dives near the Red Lady light at the northern end of the channel. The second site was to be Heather Island with the drills being performed along the sheltered edge on the NW side. Deep Dancer’s team opted for a recreational dive in the afternoon and set off for Heather Island where an encounter with a washing machine was reported. A dramatic description of a piece of free floating kelp moving briskly in one direct while divers moving just as briskly in the other had a smattering of heroic saga about it. This was however confirmed by several pairs in the other boats. Large shoals of sprat were reported. The vis was very patchy today. Finally one pair of divers remained at Puffin and dived the pontoons, reporting a very pleasant (surely not -ed) dive where a good deal of life was observed including some very striking pouting. The boats were recovered and washed off in a very efficient manner with those more familiar with these operations showing the way. Apart for a minor incident with a new tyre getting a nail in it, that was it. The boats were returned from where they came and various refreshment stops made before ending up at the club hut and calling it a day. Thanks today are due to Steve for organising the event, to Alan and Sue for making their boat available for training , to Dave for bringing the new Plan B along for some recreational diving and to all the people who made the event such a worthwhile day. A special thank you goes to our mystery or was that celebrity instructor who joined ‘The Butcher’ for the day. No photos today as we were training but as the vis was appalling I doubt we would have sen much anyway. With the East coast at Eyemouth reporting a 2 meter swell, Paul towed ‘Deep Dancer’ across to the West where we had an easy launch from the Loch Linnhe marina slip and easy access to some sheltered diving. Steve was Dive managing today and the plan was for some open water training and experience building for Liz and Kim, while Hamish had the opportunity to put Paul through his paces. Bethan had decided to join us as a non diver to gain further boat handling experience and manage the slate, while I was relegated to the ‘grumpy old git at the back’. Finding a sheltered site was a delightful challenge today in the Spring sunshine and Eilean Balnagowan, the small rocky island just south of Cuil bay was selected. Having been driven out there by Bethan we explored the edge of the West side of the Island, the theory (and the chart) indicating that the bottom was sandy and less likely to be easily stirred up and if we could find a flat bit, suitable for training. 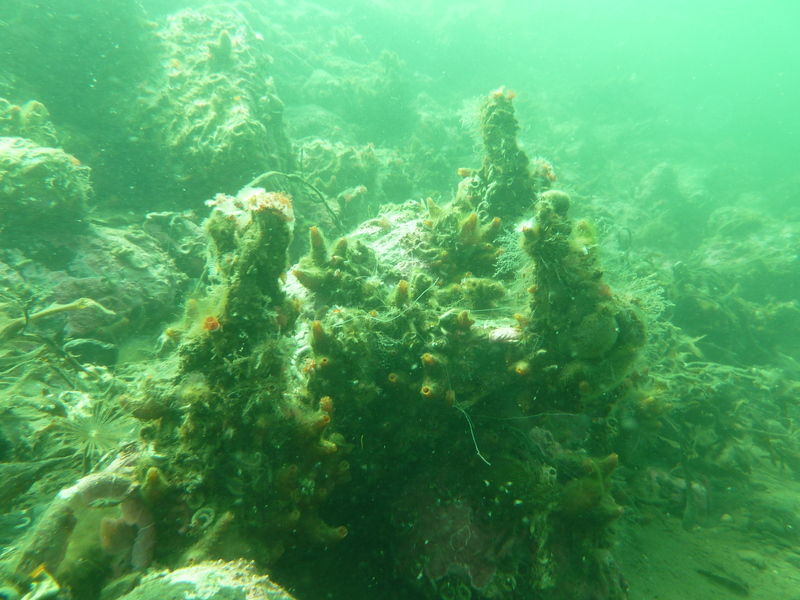 We found what looked to be an excellent site at the little bay on the North West tip of the Island, a small bay with a sandy bottom which progressed to a steep slope. Bethan duly drop in wave 1 and then practiced MOB drills and diver retrieval while keeping a close eye on the bubble trails and stood by while an errant fin was reattached. When the divers surfaced a perfect pickup was delivered, so a great well done ! Steve and Liz reported a good fun dive, practicing buoyancy drills and then enjoying a gentle drift southwards on the ebbing tide. Hamish and Paul surfaced on the dot according to the plan having explored the slope. Neither group reported exceptionally good life but the vis was excellent. Wave 2 was dropped in at the bay and performed drills before moving Northwards around the little shoulder of the bay. 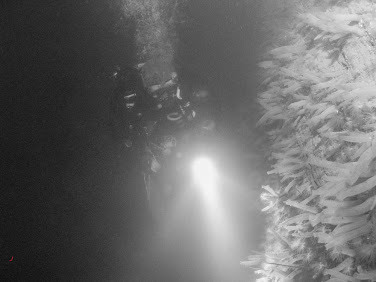 Shingle sand led to a small slabby wall which while short on life gave a good perspective to the dive. No problems reported other than a leaking mask that needed clearing continuously, but hey that was one of the drills ! Another expert recovery by the helm before zooming back to the marina through a stinging hail to tie up on the pontoons. We thought we would move the boat back to the slip to swap the tanks over but the engine decided it did not want to start. No amount of cajoling would get it going so we decided to have lunch and give it a rest while we had a chat and reviewed the days activities. Returning to the boat, it still refused to start so being mindful of the time we decided to return to Perth at a reasonable hour. Stopping at The Green Welly for fuel, Kim was spotted by Izzy who was returning from Oban with Gary and Alan who reported a couple of terrific dives off the South tip of Lismore and a picnic at the lighthouse. The next stop was the Crianlarich hotel for coffee and cake before driving back to the club hut to wash the boat down and put it to bed. Another very pleasant day with hopefully some useful skills imparted and further experienced of Scottish diving gained. Thanks go to Steve and Paul for organising. No camera with me today, but you know who had one ! This Easter, in traditional style, saw a cheery group of Club members gathering at Puffin Dive Centre, the majority of us at the 3 Anchorage caravans & B & B, but with Lynda, Tony, Lis & Stan in a caravan up at the Oban Caravan & Camping Park just along the road, John & Avril checking out the pleasures of “Glamping”,Neil & cousins moored in Puffin Harbour aboard “The Maestro”, Izzy & Gary applying discretion by joining the party just for Easter Sunday, focusing on abandoned weight belt recovery operations. Kim & I plus friends Anne &Ian, formed an advanced guard arriving on Thursday evening to enjoy one of Anne’s 6 star Michelin Guide style dinners plus the odd glass of red wine …hic! !, hic! !, hic!! Following a hearty breakfast & leaving Anne & Ian to check out the delights of a (slightly) damp Oban, Kim & I spent a busy morning working on buoyancy & trim in the harbour finishing just in time to see Tony & Lynda arrive with “Deep Dancer” and Lis & Stan too. A quick launch for “Deep Dancer” & we were off to Gallanach Bay, where Kim & I had the luxury of Tony, Lynda & Lis to help us in & out of the water! Lis enjoyed her first drive of “Deep Dancer”, the day’s diving rounded off with Lis & I checking out the hermit crabs, starfish, sea urchins, squatties and other delights of the harbour reef. Friday’s partygoers gathered at our caravan where we enjoyed some of Stan’s wide repertoire of music & brilliant banjo playing! Saturday dawned dull but fair with only a light north westerly breeze to bring a slight ripple to the Sound of Kerrera. Unfortunately, family health issues prevented David & Tam from joining us but Alan kindly allowed the Club to use “Am Feoladair” skillfully coxed by Tony & Lynda & joined by Maureen & Kim. Spike, Lis, Neil, Fred & I manned “Deep Dancer”, both boats heading off in formation for a rather pretty dive at Ardmore Bay on the southern shores of the Isle of Kerrera. 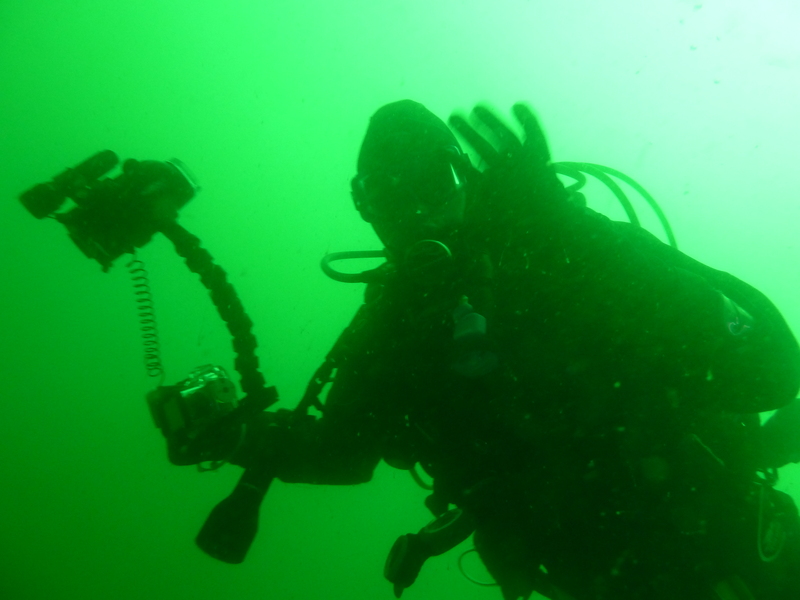 After deco & a picnic lunch, Paul & Tara arrived, Paul joining the party for a wall dive at Ard-na-Cuille. Saturday evening Neil kindly brought his large BBQ which formed the focal point for our annual Easter BBQ party which I think it is safe to say, was enjoyed by all with lots to eat & even more to drink … hic, hic, hic… !! The party ended in Alan & Sue’s caravan, though I’m afraid I’d wilted by this time & hit the sack by midnight! Following the lively Saturday evening (& it’s inevitable after effects!!) Sunday saw smaller groups out with Izzy & Gary joining Alan, Niel & I on “Am Feoladair” and Tony, Lynda, Spike, Maureen & Fred keeping “Deep Dancer” in action, first heading out to Maiden Island, then just “Am Feoladair” out to the wall at Heather Island after lunch. In the absence of scallops, Izzy spotted something yellow sticking out of the sand, Gary applying his practical Royal Marine ingenuity by using his & Izzy’s DSMBs to raise a 32lb weight belt… Emma C., if you read this give us a shout!! After a yummy Chinese takeaway for some of us Stan kicked off the music in our caravan before we moved to Spike & Carol’s … they’d been joined by retired Club stalwarts Charlie & Maureen Kennedy, Charlie having brought along his mandolin to work something of a joint act with Stan the banjo. Reports indicated the party there went on until after 4.00am! 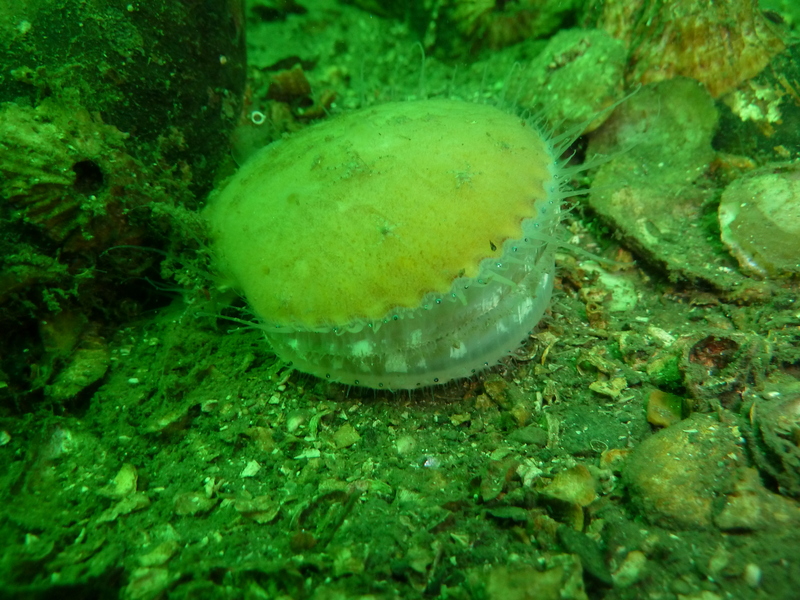 However, in true west coast style the rain stopped by 11, the sun was shining out of a largely clear sky by 12, enabling Neil, Kim I to enjoy a pleasant little dive around Maiden Island where we collected a few scallops & Alan kindly boat handled “Am Feoladair” in the (well, nearly!) flat calm conditions! We all headed home tired but happy – Alan, Sue, Sarah & Karen being the last to leave after their fish suppers watching the setting sun on Easter Monday! Thanks to all who made such a good weekend!